According to: bombarding particle, bombarding energy, target, reaction product, reaction mechanism. 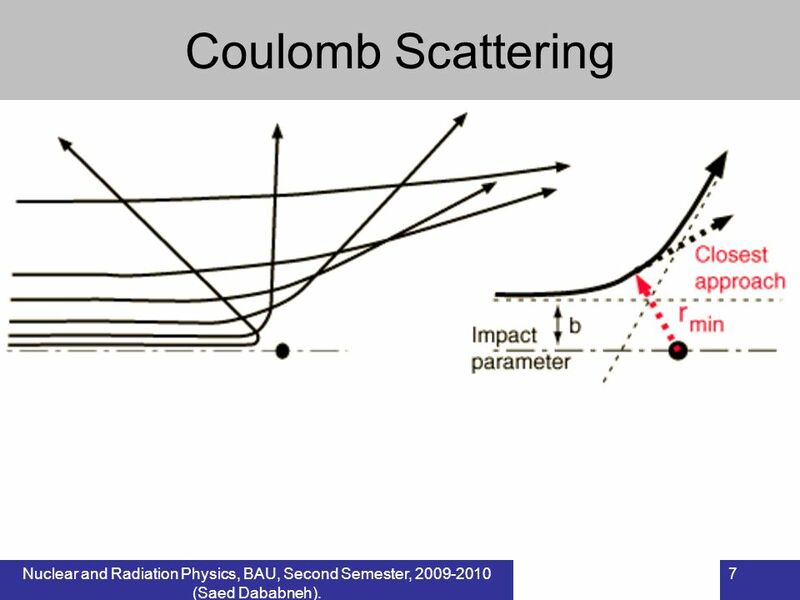 Bombarding particle: Charged particle reactions. [ (p,n) (p,) (,) heavy ion reactions ]. Neutron reactions. [ (n,) (n,p) ….. ]. Photonuclear reactions. [ (,n) (,p) … ]. Electron induced reactions…………. Bombarding energy: Thermal. Epithermal. Slow. Fast. Low energy charged particles. High energy charged particles. ? Neutrons. Nuclear and Radiation Physics, BAU, Second Semester, (Saed Dababneh). Light nuclei (A < 40). Medium weight nuclei (40 < A < 150). Heavy nuclei (A > 150). Reaction products: Scattering. Elastic 14N(p,p)14N Inelastic 14N(p,p/)14N* Radiative capture. Fission and fusion. Spallation. ….. Reaction mechanism: Direct reactions. Compound nucleus reactions. More in what follows …. What is a transfer reaction….????? 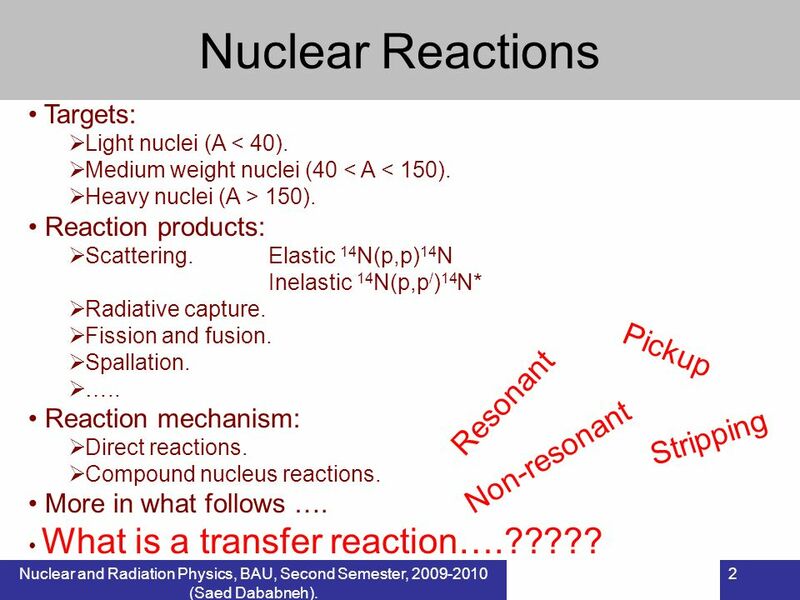 Pickup Resonant Stripping Non-resonant Nuclear and Radiation Physics, BAU, Second Semester, (Saed Dababneh). Probability. Projectile a will more probably hit target X if area is larger. Classically:  = (Ra + RX)2. Classical  = ??? (in b) 1H + 1H,	1H + 238U,	238U + 238U Quantum mechanically:  =  2. Coulomb and centrifugal barriers  energy dependence of . Nature of force: Strong:	15N(p,)12C	 = 0.5 b at Ep = 2 MeV. Electromagnetic:	3He(,)7Be	 = 10-6 b at E = 2 MeV. Weak:	p(p,e+)D	 = b at Ep = 2 MeV. 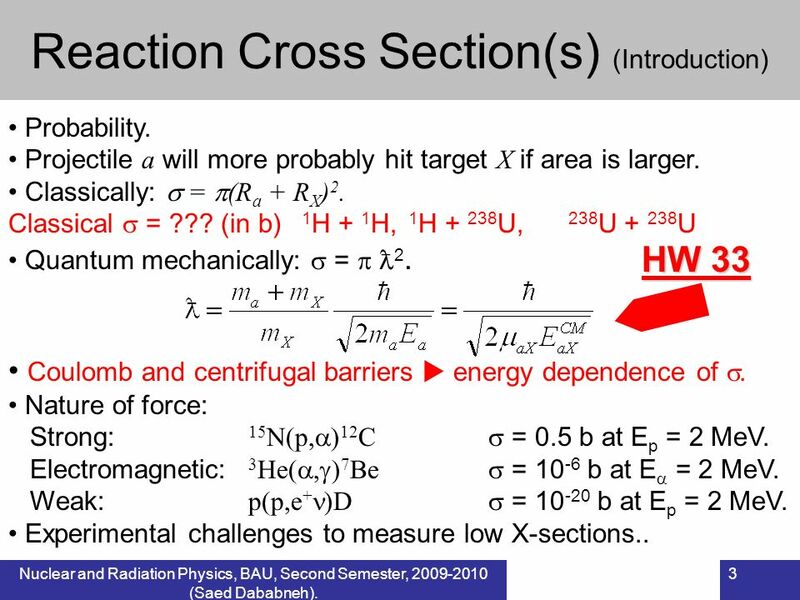 Experimental challenges to measure low X-sections.. HW 33 Nuclear and Radiation Physics, BAU, Second Semester, (Saed Dababneh). Detector for particle “b” d Ia “b” particles / s , cm2 “X“ target Nuclei / cm2 “a” particles / s Typical nucleus (R=6 fm): geometrical R2  1 b. Typical : <b to >106 b. Nuclear and Radiation Physics, BAU, Second Semester, (Saed Dababneh). Many different quantities are called “cross section”. 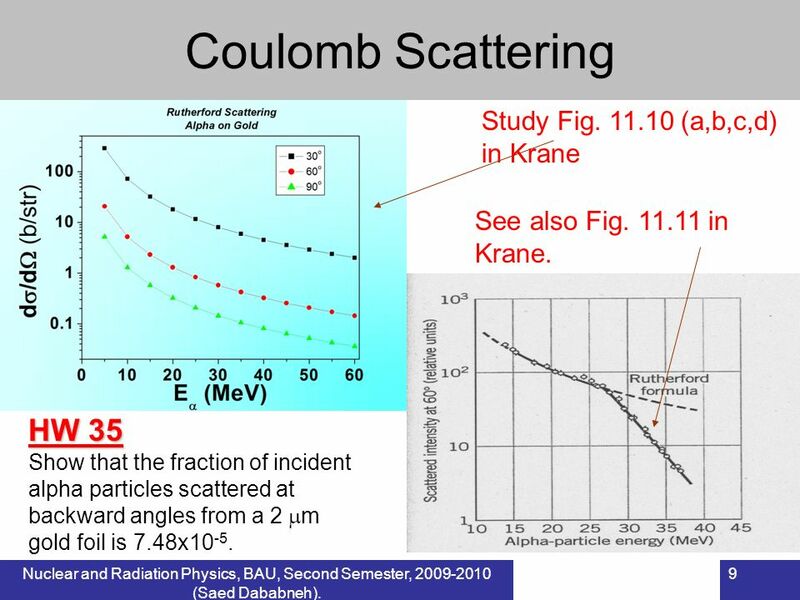 Krane Table 11.1 Angular distribution Units … ! “Differential” cross section (,) or ( ) or “cross section” …!! 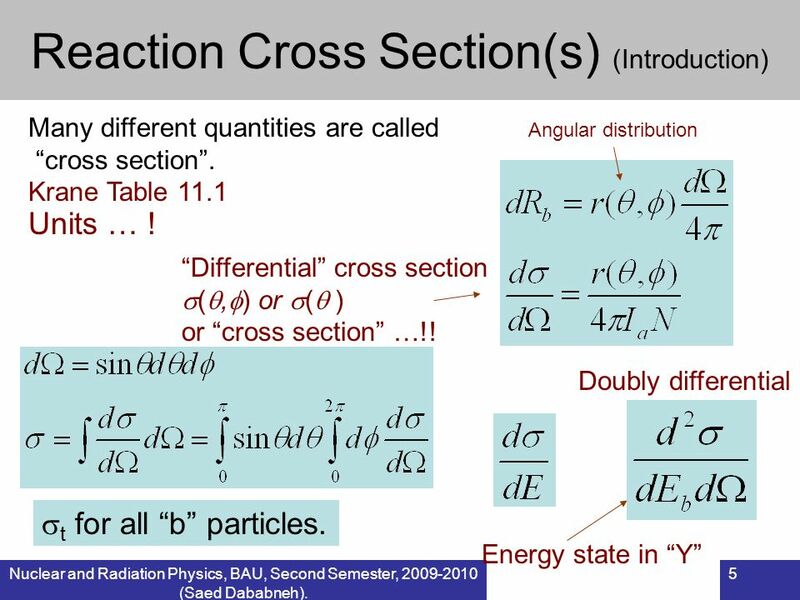 Doubly differential t for all “b” particles. Energy state in “Y” Nuclear and Radiation Physics, BAU, Second Semester, (Saed Dababneh). 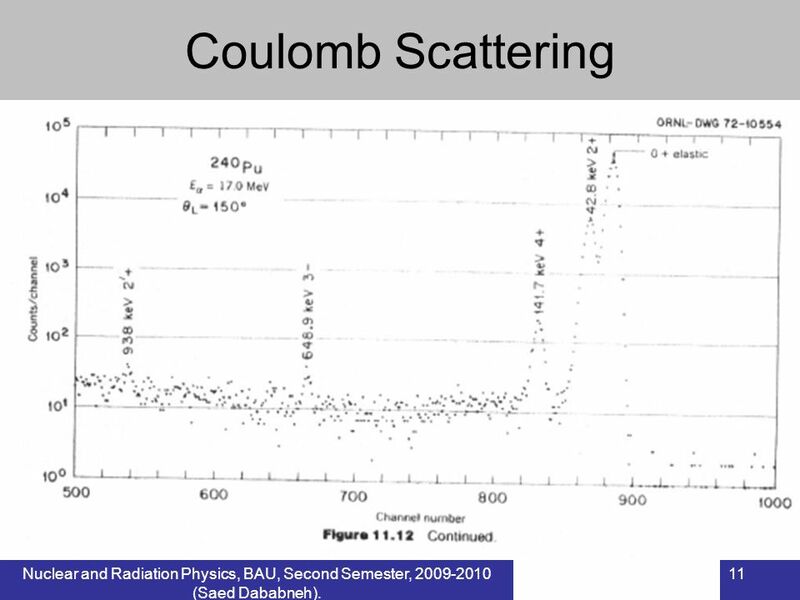 7 Coulomb Scattering Nuclear and Radiation Physics, BAU, Second Semester, (Saed Dababneh). n  target nuclei / cm3 x  target thickness (thin). 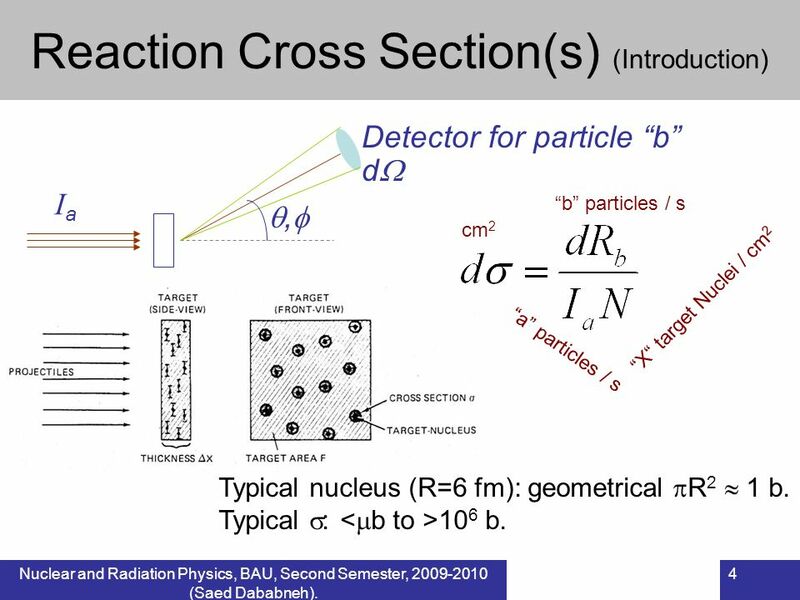 nx  target nuclei / cm2 HW 34 Show that and hence b Rutherford cross section Nuclear and Radiation Physics, BAU, Second Semester, (Saed Dababneh). See also Fig in Krane. HW 35 Show that the fraction of incident alpha particles scattered at backward angles from a 2 m gold foil is 7.48x10-5. Nuclear and Radiation Physics, BAU, Second Semester, (Saed Dababneh). 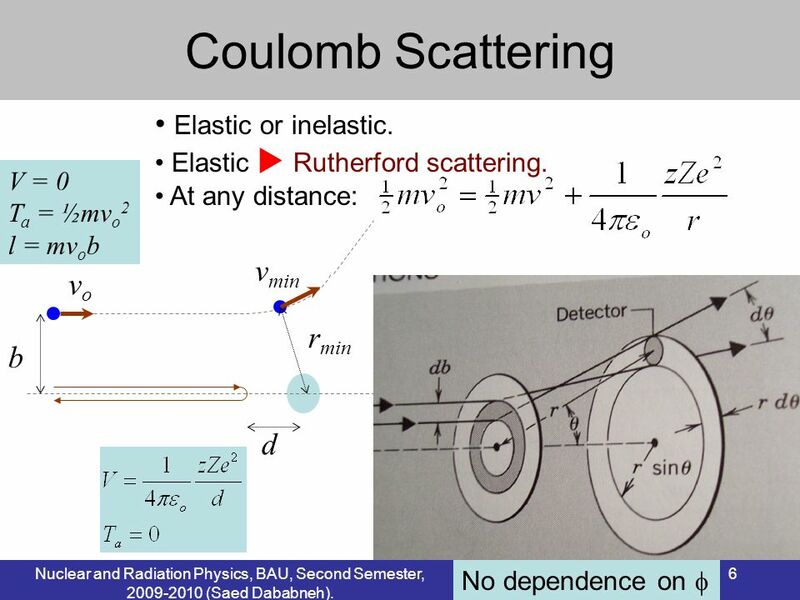 10 Coulomb Scattering Elastic  Rutherford scattering. Inelastic  Coulomb excitation. See the corresponding alpha spectrum of Fig in Krane. Nuclear and Radiation Physics, BAU, Second Semester, (Saed Dababneh). 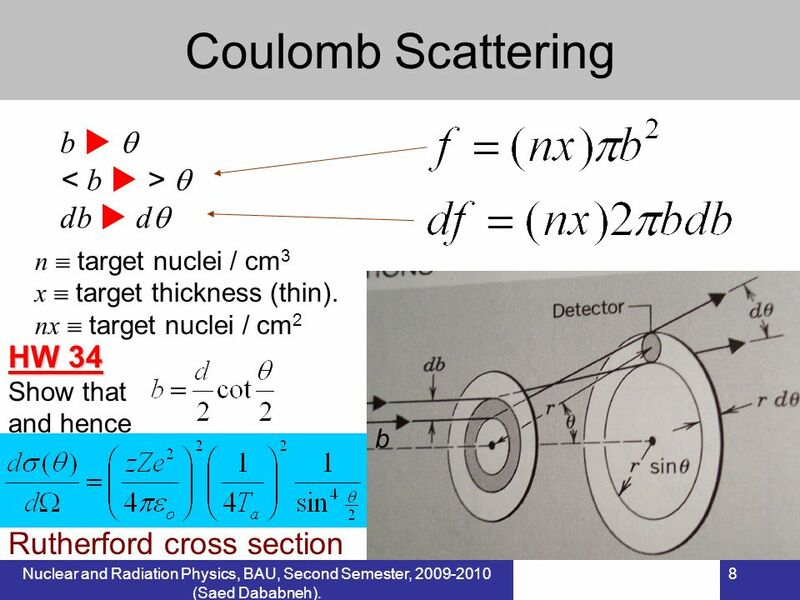 11 Coulomb Scattering Nuclear and Radiation Physics, BAU, Second Semester, (Saed Dababneh). 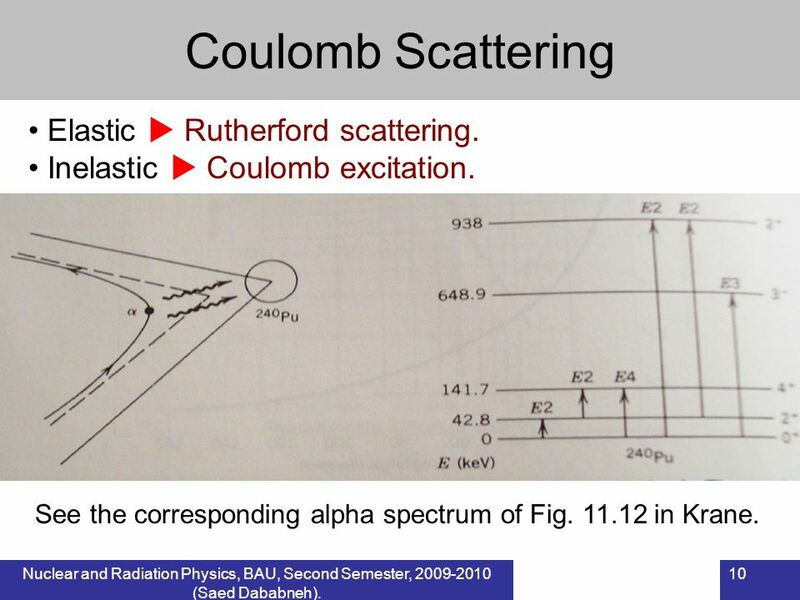 12 Nuclear Scattering Elastic or inelastic. Analogous to diffraction. Alternating maxima and minima. First maximum at Minimum not at zero (sharp edge of the nucleus??) Clear for neutrons. Protons? High energy, large angles. Why? Inelastic  Excited states, energy, X-section and spin-parity. Nuclear and Radiation Physics, BAU, Second Semester, (Saed Dababneh). Download ppt "? 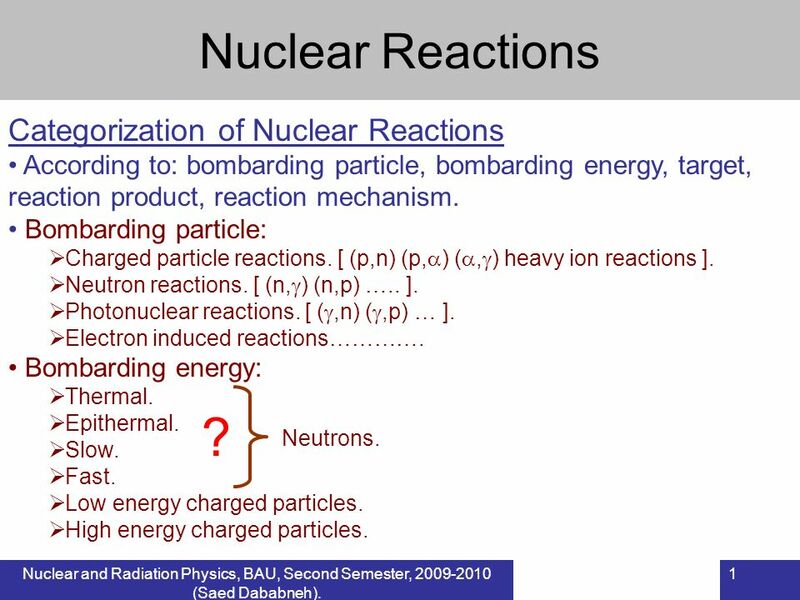 Nuclear Reactions Categorization of Nuclear Reactions"
Nuclear Physics, JU, Second Semester, (Saed Dababneh). 1 Nuclear Size Alpha particle (+2e) Gold nucleus (+79e) d Quite old!!! Neutron Excess Asymmetry Remember HWc 1. Some aspects of reaction mechanism study in collisions induced by Radioactive Beams Alessia Di Pietro.